I was craving cake all last week the other day but I wasn’t all into the idea of using the oven… every time I use it the temperature in my apartment goes up 5+ degrees (!!!) and it’s already hot as *bleep* enough as it is. So, I made a nice and creamy Cake Batter Milkshake instead! I polled everyone on my Instagram asking whether or not they’ve tried kefir. 49% voted no. Close call! I then asked what I should make with it. 32% voted Pumpkin Overnight Dessert Oats. 68% voted Cake Batter Milkshake. So I pulled my blender out and got started. This Cake Batter Milkshake tastes just like a slice of cake, but without all the nasty ingredients — no bleached all purpose flour, no refined sugar, and no butter! 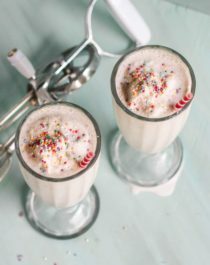 This milkshake is incredibly thick, sweet and creamy, just like a regular milkshake, but it doesn’t have any sugary ice creams, artificially flavored syrups or your entire RDI for calories, fat and carbs! Add all of the ingredients to a blender (I used my Vitamix) and puree until smooth. Give it a taste and add sweetener/ice/etc. to taste. Pour into serving glasses. Serve with natural whipped cream (avoid brands that use hydrogenated oils, I use Soyatoo rice whip) and natural rainbow confetti, or straws alone! *I used Wallaby Organic. Or you can use 1¼ cups Plain, Nonfat Greek Yogurt + ¾ cup Unsweetened Vanilla Almond Milk. **Or you can make Homemade Confetti! A Cake Batter Milkshake with only 140 calories?? Not too shabby! I could have sworn it had, like, 1,400… suuure tasted like it. When you’re craving cake but don’t want to go through the hassle of baking, make this Cake Batter Milkshake! It’s secretly sugar free, low fat, high protein, and gluten free too, made with kefir (or yogurt), oats, vanilla, and a couple secret ingredients that make it taste just like vanilla cake in drinkable form. Is it normal that my blender won’t blend ice properly? It just leaves it in big chunks and is an expensive blender what do I do?? But, if it’s an expensive blender, I would try contacting the company about it. There’s no reason why you should be dealing with that frustration!! What an awesome idea for a milkshake, Jessica. Love this and my boys would too. Thanks! Whoa… this is some ridiculous yum going on! Almond flavor has a much more neutral flavor than almond extract. Almond extract has alcohol in it, so a few drops too much can be overpowering. Both can work in this recipe though, but I would recommend using only a few drops of almond extract. Maybe start out with 3 or 4 and add some more if you feel like the milkshake needs it. Oh! I have all the ingredients for this milkshake on hand already, so I know what I get to have tonight watching my show!!! Thank you for another great dessert that anyone can have! This is fantastic! You can not go wrong with anything gooey or involves batter! OH MY Goodness! This is a Wonderful milkshake! It taste so delicious- I love it, love it. This is the first milkshake that I have had in years! I didn’t have the ice cream kind due to all the calories. I am very glad that you made this milkshake recipe for us- Thank you! YES! I’m so glad you made this!! I made this and it turned out fantastic! I added about 3/4 tsp xanthan gum and it came out super thick like a DQ Blizzard. Thanks so much for sharing! Is there alternative to the metamucil to make it thicker? Fiber supplements don’t agree with my stomach. I really want to try this! Apparently, I’m blind. I read this recipient like 20000 times and just now saw the add more oat flour in place of metamucil! Thanks for making the recipe and letting me know how it turned out! I made this recipe for my son and his friend and they loved it! YUM!!!!!! Although somewhere I saw an updated version or something because the one I made didn’t have oat flour in it. It used protein powder instead and psyllium husk powder. It was so thick and creamy!! It reminded me of a Wendy’s vanilla frosty since I used vanilla protein powder. I made it with yogurt and it was amazing, but I want to try cottage cheese next time. Thanks for sharing this delicious recipe!!!!! Genius! You can swap the oat flour with some vanilla protein powder and a little bit of psyllium if you like. This recipe is pretty adaptable. And good idea with the cottage cheese, that’d be delicious! Wow… That cake batter milkshake looks absolutely delicious! I need to try that ASAP!! omg milkshakes are my weakness, I can’t wait to try this one!!! !